Meals cooked on the trail or in a cozy pioneer kitchen had flavors and ingredients in common. We've taken a look back at the cooks and foods of the Old West to give you a taste of the life and times as well as many authentic recipes that have been handed down from that period. Also included are dishes that have been updated to reflect modern cooking methods and ingredients. Enjoy your excursion into cooking in the Chuckwagon, Pioneer, and Southwest traditions as you recreate the flavors that won the Old West! 271-page cookbook includes over 235 recipes, home remedies, and household tips. 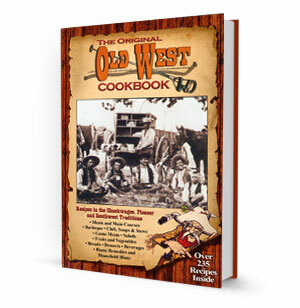 Contains Recipes in the Chuckwagon, Pioneer and Southwest Traditions. Enjoy Six Shooter Steak, Stewed Chicken and Dumplings, Mountain Man Beanless Chili, Asparagus with Tomatillos, Navajo Fry Bread, Apple Denver Pie, and much more! Perfect for fans of rustic cooking. All recipes updated for the modern kitchen.